Mario was an amazing Guide. He was funny, was very versed in Australia history and was all around entertaining. I was only in Sydney for 24 hours and found this tour. It was the right length, price and got to see what I wanted. If you only are in Sydney for a short time, this tour will truly give you the highlights. If you are going to be in Sydney for a few days, this tour will give you directions as to what to do next. Mario gave great suggestions as for places to eat and things to do. Take this tour as it was everything I wanted and more. Our guide was outstanding. He shared so much information about Sydney’s past and development. 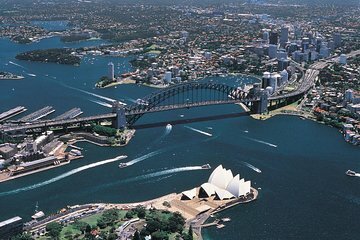 We saw many of the landmarks, opera house, bridge, bondi beach, harbor and several overlooks. Was a great introduction to Beautiful Sydney. The tour was ok, nothing special, but the tour guide Chritof made the tour personal and he was full of information with a sense of humor, I think we would have enjoyed the tour more if it was not raining cats and dogs!! Tour was about 3 hours and only 3 stops, 2 very briefly. Driver gave historical information, but more focused on pointing out where Hollywood stars lived in Sydney. If you just want an orientation to the city layout, Big Bus can provide it cheaper with more flexibility to stop where you want. La visita fue un completo desastre. Contratamos tour en español y fue un completo engaño. Nos dieron auriculares contando la historia de la ciudad de Sydney pero estos no narraban las cosas en el orden de la visita. Por lo que estabas viendo un monumento y tus auriculares estaban narrando otros. Además éramos 5 personas y solo nos dieron 4 auriculares. El guía no sabía no una sola palabra de español. La verdad es que nos sentimos profundamente estafados. No la recomendaría bajo ningún concepto. Paul was an awesome tour guide. Very knowledgeable and personable. It was a smaller group and that was good. The tour bus was comfortable and they picked us up at the hotel. He gave us good tips about things to see and how to get there. My tour was fantastic and it was a wonderful overview of this great city. My tour guide, Axl delivered a really great experience. I would recommend this tour to anyone visiting Sydney.